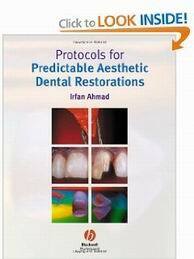 Protocols for Predictable Aesthetic Dental Restorations PDF Download Ebook. Irfan Ahmad focuses on the principles of aesthetic work across the dentist’s repertoire, rather than concentrating on one particular technique. For this reason, it will add value to the range of daily restorative work in the dental surgery. The author describes a ‘chronological clinical journey’, starting with clinical assessment and treatment planning, including choice of ceramic system and colour and shade analysis. He then devotes individual chapters to successive stages in treatment to provide a crown for a tooth, such as core placement, tooth preparation, temporary restoration, impression taking, try-in and cementation. Very little attention is devoted to registration methods. Although the liberal use of photographs makes this book extremely attractive to look at, the choice of illustrative cases is curious in places. Chapter 6, for instance, shows a case with widely spaced upper anterior teeth, where a reverse overjet is created orthodontically before crowns are constructed to close residual spacing. No clinical picture of the final result is presented, but judging by the illustrations which are provided, the width/length ratio of the final restorations does not appear particularly favorable.